Katie Wild Child celebrated her 6th birthday on October 23, 2004. As is our custom, we honor this occasion with a BASH!!! Sit back, free your imagination, and enjoy the adventure! Chapter 1 It's a Party! It seems that I have spent an inordinate amount of time at the airport at the beginning of a BASH, waiting for furkids to arrive! Funny though... I always seem to get a lot of glares when I arrive. The Scotcorde has assumed a rather notorious reputation around here, always associated with chaos and wild behavior... and usuallyends with the arrival of some branch of law enforcement. As a result, any time I show up, the airport authority immediately gets on the phone, calling in security reinforcements. Katie and Riley had always kept me company here in the waiting area, as they impatiently scanned the skies for the first sight of Sleek One! But, THIS time, things were different! As soon as we arrived, they both claimed to have OTHER things to do. Katie immediately trotted off to check on the Scotcorde's arrival time. Meanwhile, Riley hurried off to make an important phone call. This left me sitting in the waiting area alone, trying to ignore the glares of the airport staff. It had been quite a while since Katie and Riley had run off to places unknown, and I was beginning to worry. I got up and strolled over to the large, plate-glass window that faced the tarmac, and watched a nearby plane as it was backed out of the gate. I glanced out across the airport just in time to see the Scotcorde touch down. My eyes hurriedly searched the concourse, looking for Katie and Riley. It was so unusual for them to MISS Sleek One's arrival! As I continued to watch the Scotcorde, it slowed to a stop at the end of the runway, then turned. I expected it to taxi toward the gate, but was surprised to see it slow to a stop at the far end of a seldom-used runway. Worry was quickly turning to dread.... things were NOT going as they usually did! I didn't like this at ALL!! Sleek One sat at the end of the runway for several minutes, isolated and alone. My panic level was quickly rising, which was also being noticed by the nearby security officer. He walked over, glanced out at the plane, and asked if he could be of assistance. "Binoculars....I need binoculars!" I ordered. "Hurry!" The security officer, taken back by the terse orders, hurried off to follow orders. He returned seconds later, the binoculars in his hand. I snatched the binoculars from his hand, and focused them on the Scotcorde. The door opened, and the custom-designed stairway emerged from the fuselage, extended downward, and gently touched the tarmac. Scotties by the dozens trotted down the stairs, where they stood around in groups, talking excitedly. The security officer was not leaving. He waited impatiently as I anxiously watched the arrival of the BASH guests. Finally, he asked "Well, what're they doing out there?" I didn't care that he would have NO idea what I was talking about. I began commenting out loud as I watched the scotties' arrival. "Dunc and Stormy are there. They came the stairs down paw in paw. And that looks like Wolfgang Yeager, in the cowboy hat and boots...ohhh, my, Annie Laurie is really cuddling close to Baxter Arthur Nyberg...don't know what they're laughing about, but they're having a grand time, obviously. Megan Wynne and Bailey Doud are right behind them... sure looks like everyone's holding paws today. Doesn't Megan Wilson look cute in that designer Versache outfit! And Mason Bruce looks so handsome walking alongside her. Awww...he held her paw as she stepped down onto the runway! How sweet! Ohhh, look - aren't the shih tzu's cute! That's Chester, Odi, and Bandit! 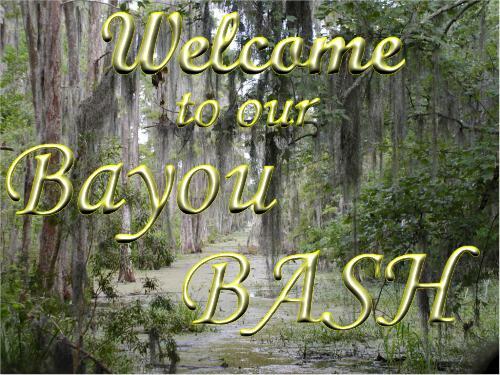 My, my, that fur is going to be REALLY hard to keep clean here on the bayous!! And there's Lucky Laddie, holding Aggie Bruce's paw. What a cute couple they make. " The security guard looked at me, a confused expression on his face. He shook his head. "Don't worry," I told him, "they're really quite sweet. They just play hard. Don't believe everything you hear." The binoculars once more focused on the Scotcorde stairs. I laughed at the group gathered around the Scotcorde. "Why are Alex Mathisen, Duncan LacLeod Brewer, Darby Lawrence, Connor Bruce, and Stewart Almandinger dragging that huge fire hose around?? OHHH, MY... they're spraying everyone as they come down the stairs!!" I couldn't help but smile... it was only water, and they'd dry...although some would need a brushing, but no one would care! "OHHHHHHH, what a leap!!! Floyd Johnson jumped from the Scotcorde doorway to the ground in ONE motion! Boy, that agility really comes in handy when you want to avoid that firehose!!!" The security guard was now staring out the window, nose almost touching the glass, eyes narrowed, as he tried to focus on the details as I described the activity at the Scotcorde. "Uh oh.....what're they dragging????? LOOK, back there.....at the rear of the jet.... they're bringing out an enormous box. Sure must be heavy....look how many it's taking to get it down the ramp!!! That's Robin Baillargeon, with Murray Reyner, Bucky and Bear Powers, O'Reilly Nuckles, Pepper Rupert, Heidi Delli Carpini, Alexander Bradbury, Sydney Mayne, Mackenzie Sue Barfield, Brewster Wynne, Bonniedoone, Abbie Sagadin, and Sunny Quarry. BOY, they can't even LIFT the back of it... they're DRAGGING it! OOPS....they dropped it. Looks like someone's hopping around. Sure hope it didn't land on someone's paw! Must not have been TOO bad, everyone's tuggin on it again." The security guard was now totally engrossed in the activity at the plane. He turned to me, asking, "WELL??? What's happening NOW??? What?? HUH??" I glanced at the security guard and smiled. Turning back to the window, I once again lifted the binoculars... I couldn't understand why Katie and Riley were missing the arrival of their friends. That did NOT give me a sense of comfort and reassurance. Things tended to become extreme and chaotic when Katie and Riley were NOT in sight. "Ohhhhhhhhhhhhh, not again!! LOOK! Coming out of that far hangar over there! See that huge 18-wheeler?? What are they planning NOW???" The security guard was staring hard, straining to make out the movement on the far side of the tarmac. He leaned over and put a hand on the binoculars. "Lemme see," he complained, as he grabbed for them. "Unh Unh!!! No you don't! I'm a scottie Mam, and am used to keeping valuable things away from determined scottie youngsters. I SURELY can keep YOUR hands off these glasses!" With a gentle slap on his hand, I smiled sweetly, then returned the glasses to my eyes and continued my description. "What in the......? The 18-wheeler is backing up next to Sleek One. Looks like everyone was expecting it, they're all crowding around. Wait, someone's climbing out of the cab." I waited impatiently as the door of the truck slowly opened..... then gasped. "OHHHHHHHHH, NOOOOO! Get me out there, NOW!" I screamed at the security guard. His look of confusion only lasted a second. My firm PUSH on his shoulder spurred him to action. With a quick "follow me", we raced down to the access door that led to the runway. "Why are we RUNNING?" the security officer asked over his shoulder as we reached the runway and headed toward a nearby pick-up. "I know those two who were driving the truck!!! TRUST me, when they get that devilish look on their cute little faces, it means TROUBLE! The LAST time they got creative around the airport, they had to call in the MILITARY! Now, do you want to avert a disaster?? Or would you just rather wait and watch the news report on FOX NEWS???" The security officer, scared now, had HEARD the stories of what had happened at PAST arrivals of this famous Scotcorde. He leaped into the truck, leaned over and threw the passenger door open for me, and threw the truck into gear. "Ohhhhh, we CAN'T let something like THAT happen.....not AGAIN!!!!!!!!!!" he said as he spun the steering wheel sharply to the left. I could only hang on for dear life, as the pick-up raced across the airport, careening first one way, then another, as we raced toward the Scotcorde, the 18-wheeler, and the WCGang!! Chapter 2 Up, Up, and Away!! The security guard and I reached the Scotcorde just as the back doors of the huge semi-trailer were thrown open. Katie and Riley were standing in the trailer doorway, waving to their friends. They saw me standing at the back of the crowd, and waved excitedly. "Hey, Mam!! We're gonna take a ride. Wanna COME???" Katie shouted, a gleeful smile spreading across her face. Glancing back at the suspicious expression on the security guard's face, I quickly decided to eliminate that threat to the scotties fun. Turning back to the pick-up, I smiled broadly. "Ohhh, it's okay, officer. It's just my two furkids, bringing the .... uhhhhhh, party favors.... yeah, the party favors. They're having Katie's birthday party onboard the Scotcorde, and Riley is providing the 'party supplies'! I'll be here to supervise, so there is nothing to worry about. I'm certain you have more important things to do than to sit around here watching scotties crochet doilies! They just LOVE to crochet doilies at ALL their parties, for the Old Scotties' Home, ya know." I had definitely been blithering, and it did NOT sound anything even CLOSE to believable. But, I waited, holding my breath. "Well, okay," the officer said, his eyes scanning the furry crowd. "It looks like a harmless group...they certainly are too small to cause any trouble. I guess it'll be okay." The guard returned to the pick-up, and with one last glance at the innocent-looking crowd, he wheeled the truck around and sped back toward the terminal. I breathed a huge sigh of relief, then turned my attention back to the Wild Child Gang. They had unloaded several ENORMOUS boxes from the back of the truck. Everyone was gathered around, all talking excitedly. Emmitt Bad Boy, Robbie McGillivray, Dougan Gray, Angus Moynan, MacDuffy Lemmon, Sherman Sheets, and Cammeron Meverden had disappeared into a massive box. Thuds, complaints, and grunts of exertion were all heard coming from inside the huge crate as they struggled to pull the contents from the container. Katie strolled up and slipped her paw into my hand. She smiled up at me, which did little to reassure me or ease my suspicions. "We're not going to get into trouble," she said with a broad smile, "not this time. Not YET! You're going to LOVE this! It was Riley's idea. You'll probably get a better view if you stand over on Sleek One's stairs." Her paw patted my hand reassuringly, then she led me to the foot of the Scotcorde's stairway. With a last smile, she raced back to her friends, to supervise the action. A tap on my shoulder drew my attention. I looked up to see Captain "Scotty" smiling down at me. "She's right. The view is MUCH better from up here! And relax, they're not going to create any catastrophe.....not with THIS!" Captain "Scotty" moved farther up the steps, pulling me along with him. As we reached the landing at the top of the stairway, we could see out across the entire area. The truck had been unloaded, and had been moved some distance away, where it sat abandoned. 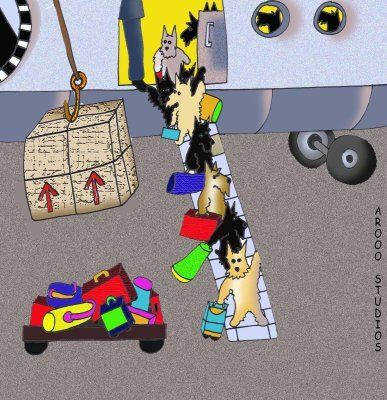 Scotties and their pals were scurrying back and forth, following Riley's instructions as he stood atop a wooden crate, issuing orders. The remaining crates were unpacked, their contents spread across the tarmac. Huge sections of brightly colored fabric were gently laid out in an open area. At one end of the fabric sat what appeared to be a huge machine with an enormous exhaust extending from it. Enthralled, I watched as the scotties quickly and efficiently went about their work, preparing the entire area for some sort of great party. I watched as Reagan Wion, Breeze and Gus Oglesby, Bartholomew van Dulken, Lucy Smith, Sera Battson, and Hoagy Devine, under the supervision of Jake Lawrence, managed to drag a huge, wicker container from the Scotcorde's cargo bay and place it on the ground beside the machine. "Just watch," Captain "Scotty" said, noticing the confused expression on my face. He nodded to Honey Bear, who was rearranging the brightly colored fabric that was stretched out on the ground. She immediately went over to Riley and whispered into his ear. Riley smiled broadly, raised his paws into the air and announced, "It is TIME!" Immediately everyone raced to the huge, wicker container and leaped inside. The Guardian Brigade had to boost many of the wee ones into the massive wicker container. As soon as all of the BASH guests were safely inside the container, Honey Bear moved to the machine, turned it on its side, and flipped a switch with her great paw. Flames shot out from the exhaust. The air around the Scotcorde began heating up, as if the entire world could feel the intense heat from the orange flames. The excitement spread through the scotties as the brightly colored balloon began to fill with the heated air. They cheered wildly as the balloon took on a life of its own as it slowly grew in size and began to rise gracefully from the ground. Finding myself caught up in the excitement, I clapped happily as the balloon slowly lifted the huge wicker gondola into the air. The scotties squealed gleefully as their balloon continued to float ever upward...wee, furry bodies leaned far over the side of the gondola to wave back down to us who were earthbound. The scene was breath-taking as I watched the balloon's graceful ascent... the red-yellow-blue-green-purple stripes showing boldly against the clear, blue sky. It was the body hurtling from the gondola that brought me back to reality in a hurry. A scream escaped my lips, as I clutched Captain "Scotty's" arm in a death grip! The Captain calmly patted my hand. "Relax.....and watch," he said with a grin. I couldn't breathe as I watched the scene unfold overhead. The small, furry body seemed to drop forever, then suddenly stop, to bounce back upward, almost to the gondola. "They're BUNGEE-jumping from the balloon?!?!?!?! OHHH, my gosh! Is it safe? Who's watching them? What're they THINKING!?!?!" Captain "Scotty" laughed, a hearty laugh that extended to his twinkling blue eyes. "Never fear," he said. "Champ is there harnessing them in. Jake and Reggie Lawrence and Callie Howett are supervising. They're completely safe." 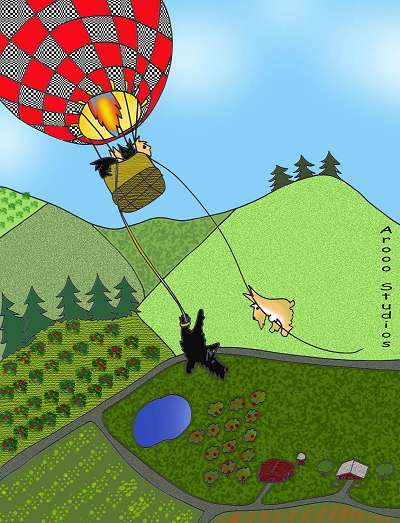 I stared in open-mouthed fear as I watched first one scottie, then another LEAP out of the safety of the balloon gondola, paws extended wide, beard and furnishings plastered back against their bodies....arrroooo'ing at the top of their lungs as they tumbled earthward. Time seemed to stand still as each furry body dove happily over the side of the wicker basket. The BASH party was in full swing.... maybe full BUNGEE would be a better description. As the balloon reached 1,000 feet, the bungee-jumping seemed to stop. The feeling of relief was overwhelming.....until I realized that the balloon was disappearing into the distance. The cell phone rang just about then, and I knew before I answered it.... it was Katie. "Didn't ya LOVE our Scottie Death-defying Leaps, Mam??? Don't worry.......we'll be back in a week or so. We're fine, we have everything we need. We're going looking for a BASH adventure. See ya later......bye Mam, Love ya!" I watched helplessly as the colorful balloon grew smaller and smaller, to finally disappear in the distance. They were going LOOKING for adventure! The silence was deafening, the view was incredible, the wind in the fur was exhilarating, and the sheer beauty of it all took their breaths away. For once, there was silence among the BASH party-goers. They were floating on the wind, following the breezes. Furry muzzles peeked over the edge of the gondola, eager to live this moment to the fullest. Up here, the world lived in silence, with only the sound of the breezes to disturb the peace and serenity. Looking down on the world below, the scotties saw the open fields change to green forests, then to a deep, rich emerald world of swampland. Several of the scotties were experiencing their first BASH adventure. They had heard the tales of the many exploits into the Bayous of the Wild Child Gang, and were anxious to create some history of their own. Midget Wion leaned back against the gondola, propped her wee paw on the wicker, and had the group enthralled with her tale of wrestling a 'gator at the first, original BASH, way back WHEN. Andy Oglesby, Cassie Georges, Fala Lang, Katie Princess Sensenbach and her brother Brewster, Cinnamon Murray, Lilly Gilmore, Cap'n Eddie, and Whiskey Moynan, all attending their first BASH, were spell-bound with Midget's tale, and were soon talking excitedly about making their OWN paw-mark on the BASH legends. The "First Timer Friends" sent Cap'n Eddie to talk to Riley, who agreed whole-heartedly to the plan, and immediately leaned out over the edge of the gondola, searching for something. "Good, we're not too late," Riley said as he turned back and adjusted the balloon's burner. "The wind is right, we'll soar right over it in a few minutes. It'll be a GREAT adventure." Riley turned and announced to the entire group that they'd found their adventure!! He then reached overhead, opened the vent on the balloon, and began a slow descent into the swamp below. Curious about their destination, the scotties began peering over the edge of the gondola, eager to be the first to solve the mystery of their destination. "LOOK!" squealed Angie Riches. "OHHHHH, GOODIE!" She was beside herself with excitement. She KNEW that this would, indeed, be an adventure to remember. "YESSSSSSSSS!" Sam E Williamson shouted, closing his paw into a fist and jerking it downward in a sign of success. Looking over at the newcomers, he added, "You guys won't BELIEVE what fun we're going to have NOW!" "WHEEEEEEEE!!!" exclaimed Agnes Donnelly, as she spotted a familiar landmark just below the rapidly descending balloon. "Ohhhhhh, this IS going to be fun!" Haley Devine was beside herself with excitement. She KNEW what was in store for them now. She tapped Billy Delli Carpini on the shoulder,a huge smile on her face as she pointed toward the ground. Billy peered over the edge of the gondola, then looked back at Haley. With a twinkle in his eye, he flashed her a toothy grin. They were true scotties, as were all the BASH guests.... they thrived on the adventures presented in their BASH trips. It would be GREAT to live on the edge again, to laugh in the face of danger, to tempt fate... they were all ready for this adventure!! "Bring it ON!!!" Billy shouted happily, beaming broadly. The rest of the BASH adventurers were now hanging far over the edge of the gondola, all eager to see their destination. The excitement was electric as they all realized where they were heading. Within minutes, the balloon had settled gently to the ground. They knew this place. The well-manicured lawn was unexpected in the midst of the huge swamp. Looking across the wide yard, they saw a very old building. It had seen better days, as the peeling paint fell away from the wood. Huge, majestic columns rose high before them, supporting a wide roof. This had once been a great plantation, before the swamp had begun its quest to take possession of this once-grand home. Everyone watched expectantly as Riley made his way to the front door of the old home. Lifting his paw, he rapped sharply on the weathered door... and waited. The creaking of rusty hinges announced the slow opening of the huge door. Everyone held their breaths as they waited for the first glimpse of this legendary woman. As the door opened wider, they could just barely see her, silhouetted in the darkness within. Riley stepped forward and held out his paw. Her frail hand slipped gently into his strong paw. He pulled her forward into the light. The figure was shrouded in a dark cloak, a hood pulled forward, casting deep shadows on the face inside. "My friends," he announced to the eager group. "This is a dear friend of ours, who has allowed us to experience some incredible adventures with the help of her mysterious powers. To our new guests, I would like to present to you, Madame Francie La Roux, better known in BASH circles as THE SWAMP WITCH!!" Francie La Roux, the Swamp Witch, was ancient. Her dark brown eyes seemed to reflect the history of the ages, timeless wisdom mirrored in their depths. She stood proudly, standing next to Riley, as he held her hand gently in his paw. She seemed fragile, frail, as though made of glass. Her body was as drawn and gnarled as her hands were, but the terriers also recognized the pride and fierceness that were part of her. She was as they were, strong-willed and determined, a force to be reckoned with. Her voice was surprisingly strong as she announced, "I've been expecting you. The forces foretold of your journey back to the swamps. One of you is in search of something... something ancient, something unknown." Mystified, the scotties glanced around at each other, trying to interpret the Swamp Witch's cryptic words. Confused, they pressed closer, eager to hear every word. The Swamp Witch's intense gaze scanned the large group of terriers and their friends, searching. Her eyes suddenly focused sharply on Katie, her hand raised, beckoning Katie forward. "You come on a quest. Your wish is granted. You will be allowed to venture, once again, into the misty voids of time. Come......"
Katie's face broke into a wide grin. She KNEW her wish would be granted. She'd KNOWN it would be possible. They WERE going to be allowed this 'grandest of all adventures'!!! Her impatience to begin was obvious. She had a spring in her step as she followed Madame La Roux. Katie's excitement was contagious as the other terriers caught her enthusiasm. Breathlessly, the scotties followed the ancient woman as she slowly made her way across the lawn to an ancient cypress tree, draped in Spanish moss. Even the scotties who had never been on a BASH had heard of the Legend of the Cypress. They knew what was coming.....they raced to the tree, small paws grasping for any branch, any root. They MUST be touching the tree when the magic happened. "Through time we come, through time we go..... time is the key....to ebb and to flow!!!!!!" The giant cypress began to glow....a light from within began to shine from the branches, spreading a brilliant glow throughout the swamp. 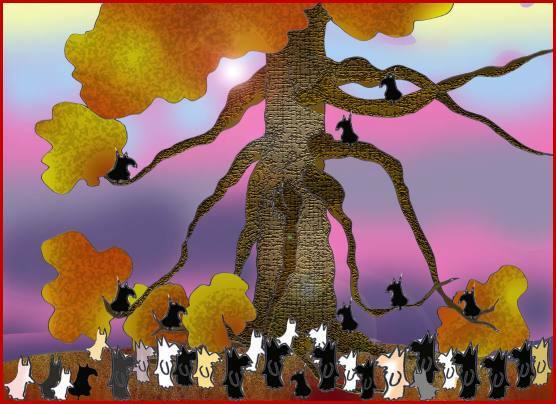 No one dared move, they were mesmerized.....their paws pressed firmly to the bark of the huge, glowing tree. The Swamp Witch raised her voice with two final words, " Time MOVES!!" The lightening flashed from the great tree, sending a blinding light exploded across the lawn. The Swamp Witch glanced around. The light from the Cypress tree had dimmed... she was, once again, alone. Smiling, she dusted off her long cloak and slowly turned back toward the house. "Interesting," she thought to herself. "Fascinating how these wee ones find such pleasure in tempting the paradox of time." Slowly, she made her way across the lawn, leaving the Cypress tree alone with its secrets. It was as if they had never existed....... the swamp was once again shrouded in silence. Where ARE THEY?? Want to take the journey THEY took?? "Touch the ancient cypress and watch TIME MOVE!"